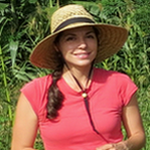 Alexia Witcombe is an agroecologist currently pursuing a PhD in the Department of Plant, Soil, and Microbial Science at Michigan State University. She holds a BS in Environmental Geoscience and a BA in English from Boston College. Alexia developed her transdisciplinary understanding and appreciation of food and farming systems through hunger advocacy work in New York City as an AmeriCorps VISTA, as a teacher and intern on farms in California and Michigan, as an environmental educator on tall ships, and as a teacher at a farm and expeditionary school in North Carolina. Her experience working with smallholder farmers in Mozambique and Zimbabwe as a Tillers International draft-powered agriculture trainer was instrumental in setting her on her present path. 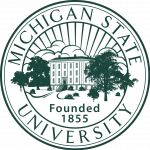 At MSU, Alexia works with Dr. Lisa Tiemann and is currently conducting research on soil nitrogen cycling and organic material flows within smallholder farming systems in western Uganda. Her research explores the interplay of socioeconomic factors, farmer management and decision making, and soil fertility.